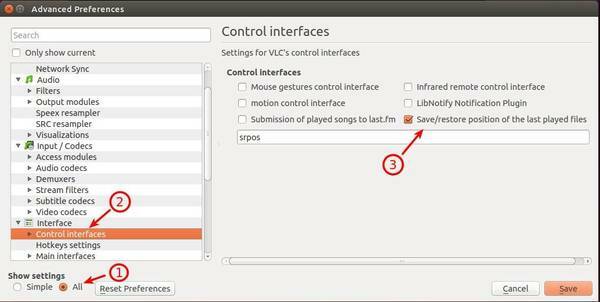 This quick tutorial shows you how to make your VLC media player remember the position of the last played files with a plugin called srpos. srpos plugin works for VLC 2.1.x in Windows and Linux. It allows you to automatically save and restore up to 100 last played files position. download vlc-srpos-plugin_0.3~trusty~ppa1_amd64.deb for 64-bit system. download vlc-srpos-plugin_0.3~trusty~ppa1_i386.deb for 32-bt system. Ubuntu 14.10 and Ubuntu 14.04 user can also download & install the .deb directly from the launchpad page if you don’t like Ubuntu PPAs. 1. Re-open VLC, and go to menu Tools -> Preferences. 2. Under bottom left corner, select show All settings. 3. Navigate to Interface -> Control Interface on left sidebar. 5. Save and close VLC. The plugin will work the next time you launch it. Finally! I wanted this feature for such a long time. Thanks. This ppa doesn’t work in ubuntu. Please fix this.